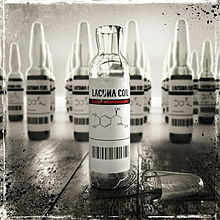 Lacuna Coil released their latest album, Dark Adrenaline, on 1-23-12, and having enjoyed their last two albums I was eager to hear this one as well. As was the case with their last album, Shallow Life, this release is also an essential addition to the music collection of any fan of female-fronted heavy metal music. With Dark Adrenaline, Lacuna Coil establish a heavier, darker vibe than they have in quite a while. Not so much so that you cannot tell it's Lacuna Coil. The essential formula is still there. In fact, this album is quite consistent with their previous one. Any changes to their sound are subtle ones. Fans of Shallow Life will easily take to this album, as it is filled with similar heavy riffs and dynamic vocal melodies traded off between Andrea Ferro and Cristina Scabbia, very much as LC fans are accustomed to. If anything, the most difference may be that this album is a bit less 'pop', and more purely metal than Shallow Life was. The first single, 'Trip The Darkness', is classic Lacuna Coil from the get-go. Choruses are mainly handled by Andrea, with his scratchy, alt-metal voice, and the bridges and choruses are sung in Cristina's captivating contralto voice. This number is melodic heavy metal, driven by rhythmic, heavy guitars and complimented by subtle synthetic effects. As with many of the band's previous albums, the mood from song to song ebbs and flows between near-thrash heaviness, and operatic soft melodies. There are some notable highlights, and unique songs that stand out. One of my favorites being 'End of Time', where we hear Cristina dwell in the lowest ranges of her vocal ability for most of the song. In atypical fashion, this is perhaps the most I've heard her push herself in mastering the limits of her vocal range. My other favorite song is 'Intoxicated' where, if anything, Cristina does the opposite. Some of the lines are delivered with true vocal acrobatics that retain melodies you're repeating in your head hours after listening to this song. It keeps pulling you back to play it again! So in summing up, Dark Adrenaline may not be dramatically different from Shallow Life, but different enough that you need to hear it for yourself. Lacuna Coil may have mastered their craft, and niche, in metal music years ago, but that's all the more reason you need to hear what they've been up to lately. Personally, I can't wait for their next album already! As winners in the Heavy Metal Madness tournament of 2012, Metallica also have won the title of this blog's symbolic president. Now it is time for their inauguration. 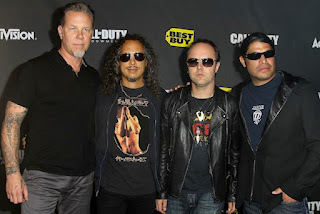 For 2012, Metallica enjoyed a mix of current success and nostalgia for some of their past releases. Beyond Magnetic, an EP of some left-over songs from the Death Magnetic sessions were finished up and released in early 2012. In the summer, they headlined their own music festival: Orion Music + More. Over 30 bands in 2 nights, Metallica headlined both nights, playing the entire 'Black Album' on one night, and Ride the Lightning on the other. These performances can be downloaded through the livemetallica.com catalog page. They are the June 23 and 24 dates in Atlantic City, NJ. They have also begun work on their next full-length album, to follow-up Death Magnetic. No release date is set, but with the direction they've been heading recently, it should not disappoint fans, new or old. So Metallica will take the lead in the world of metal music again in 2013. Orion Music + More will return, this time in Detroit, MI. WWW.HAPPYHEADBANGER.COM will follow them here as well. Their 2-year term begins now! So dig your way to something better, get back which used to be, sell your soul to me- I will set you free- pacify your demons, when we start to rock we will never stop again! Enjoy some music from Metallica! As many of you have been voting in the Heavy Metal Madness polls throughout 2012, now that it's over it is time to announce those who have won prizes in the pool. 73 contestants entered, by filling out their predictions of which bands would win the tournament, way back in the Fall of 2011! The contest rules were laid out in Post #166, and these winners have the highest scores based on that 'scoring system'. Ironically, my wife has won the overall top-score! (I invited my close family to join this contest, just for fun. Myself included!) Luckily for the rest of the field, she has declined to accept the grand-prize package, so I will still be sending the goods out to 7 lucky winners. ...and there will be a futility prize (for the contestant who finished last): in 73rd place with a score of 120: JP!! Thank you to all my friends, family, followers, collaborators, and of course my HMM selection committee (you are not forgotten!) for participating, month after month, in the massive contest! 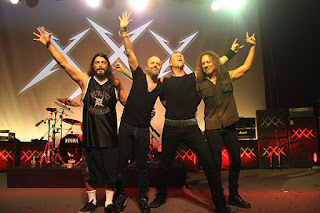 Metallica Wins Heavy Metal Madness 2012; Led Zeppelin is Runner-Up. The Heavy Metal Madness tournament of 2012 has come to its long-awaited conclusion. It may have been a 1000 mile journey, but it began with a single step, and lots of voting! A field of 68 bands was here at this time last year, and now there is only one metal band left standing: METALLICA!!! The final poll saw Metallica win first place with 36 votes, Led Zeppelin was runner-up with 31, while System Of A Down (18 votes) and Alice In Chains (10 votes) finished 3rd and 4th respectively. Thank you to all who have voted!